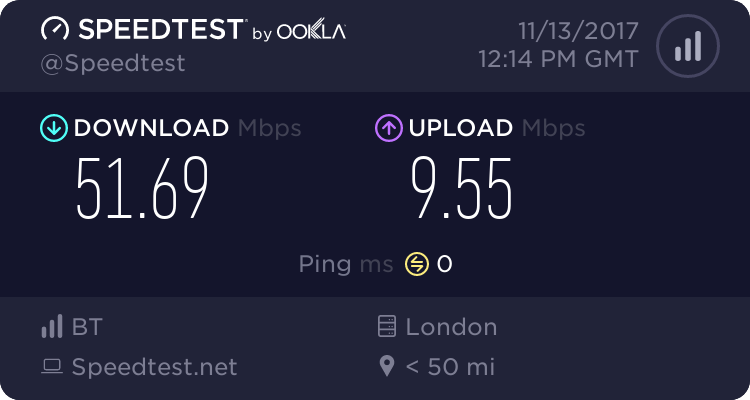 Just out of interest, does Hexus do benchmarks with all the bloatware a-bloating or do you remove / disable it? Obviously most of the stuff isn't going to matter that much but, for example, Norton running in the background could certainly affect results. Whenever I buy a laptop (for myself or someone else) the first thing that happens is the bloatware is removed to the extent possible (some of it is useful) so for me a benchmark without any bloat is useful. That said, how many of your average consumers go through start up options and disable stuff? And isn't the selection/implementation of software as important to assess as the hardware? It's a hard balance to strike and I wonder how Hexus do it (I can't see in the review but my brain is all mushy at the moment). We benchmark the laptops with all of the out-the-box software intact, as this is representative of the manufacturer's design, though we do check all available updates are applied. The 940MX is basically the MX130 so people know it's modern equivalent. Having said that the IGP scores look a little low compared to the 940MX/MX130 from memory. Also what driver version is this? Driver support has been very poor though. For yonks AMD didn't bother updating the mobile APU drivers. Then some tech YouTubers like TechEpiphany forced dGPU drivers and it worked fine with large performance jumps in games.I honestly hope they have updated the drivers now since the desktop versions launched! All their laptop CPUs have been low end chips. Nothing in a laptop worth more than £500. I expect to see better driver support with these higher end CPUs that are easily going to outperform sales of their previous laptop CPUs, particularly those E chips, they sucked! Look at the performance jump!! I assume with the desktop model it should be fine? You look for the mobile APUs,and there are no drivers for the Ryzen 5 2500U and Ryzen 7 2700U. 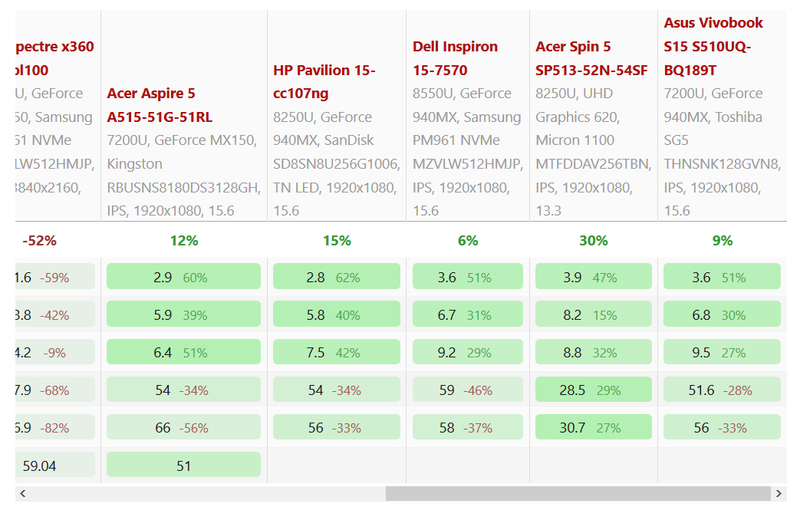 The latest drivers for the desktop APU are last month. I just expanded the install packages. On the AMD website the desktop APUs have a driver date of 03/02/2018 and the latest ones on the Acer website are 24/11/2017. I really hope that Windows has updated the drivers to something from this year,otherwise the laptops will be having drivers a few months out of date! 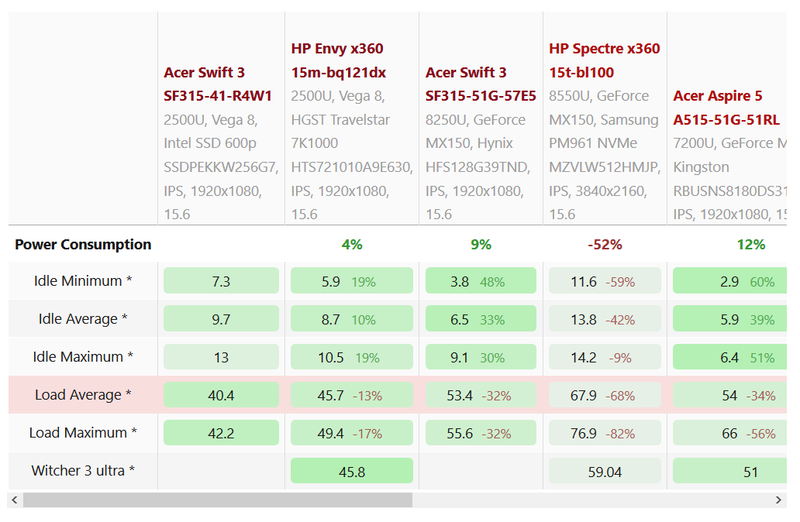 Beating the spin 5 in cinebench and handbrake is notable - the swift 3 is going up against intel core for core and thread for thread, and still winning. That's probably the 25% higher base clocks overpowering the IPC advantage. Going by the power consumption figures, I'd also suspect that the swift 3 has cranked up the power to the 25W TDP on the AMD laptop. This doesn't explain the poor battery life of course, unless the power management is non-existent - maybe AMD mispredicted the best codecs to include in the GPU fixed function block? All the RR laptops tested so far have very high idle power consumption,and even desktop Ryzen upto a degree seems to have higher idle power draw. I assume unlike desktop the 940MX switches itself off for the most part when the system is idle. Last edited by CAT-THE-FIFTH; 03-03-2018 at 12:02 PM. Its weird that we haven't seen ryzen in custom laptops like clevo ones yet. Asus made two models with desktop Ryzen CPUs. Considering you get a proper am4 socket on ryzen laptops it would be nice to see some clevo ones(I just love their designs).